The first d ecan of Libra is Crux (rhymes with juice). It is the famous “Southern Cross” now seen only from the southern hemisphere. This is due to the precession of the equinoxes, a phenomenon which is the result of the fact that the earth “wobbles” as it turns upon its axis. The best way to explain this phenomenon is to imagine a child’s spinning top. As it first begins to spin it stands perfectly erect, but as it begins to lose speed, it begins to wobble because gravitational forces are becoming greater than centrifugal ones. A similar thing happens to planet Earth. Whereas it sometimes only takes a few seconds for the spinning top to make many wobbles, it takes Earth nearly 25,000 years to make just one! Each year it moves so slightly out of its previous axis that it is not even measurable by any but the most sophisticated instruments. The effect of this phenomenon is to make the heavens appear to be moving — over a long period of time, that is. 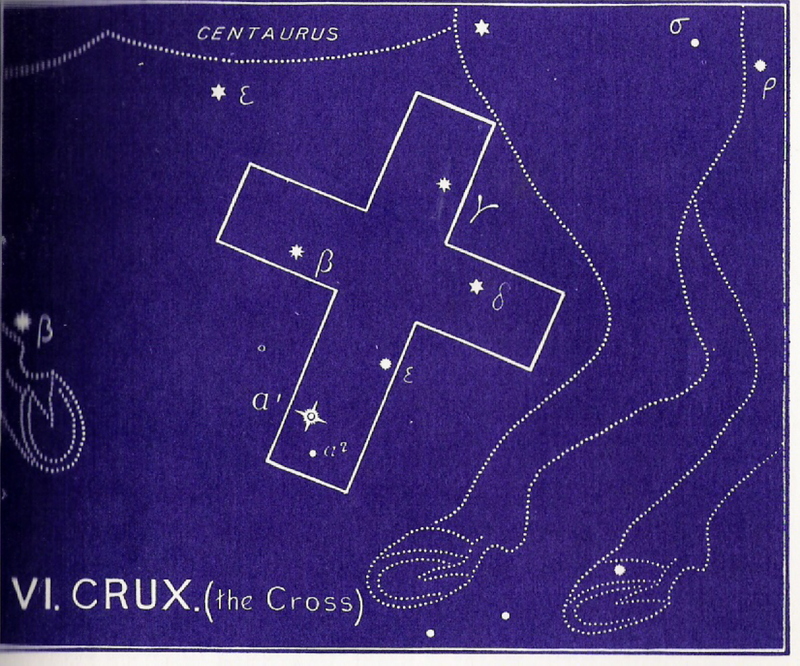 As a result of this movement, Crux is now very far down on the southern hemisphere. This sign disappeared below the horizon just about the same time that Jesus walked upon this earth in His first coming. 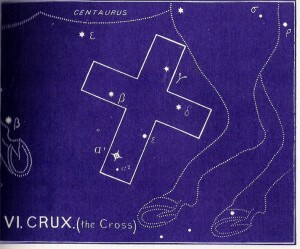 This is the picture of the famous “Southern Cross”, a beautiful constellation in the unmistakable form of a cross. It was given by God to remind us that our sins cost our Lord Jesus His very life. Jesus Christ willingly poured out His blood in so many different ways — as cruel whips ripped His back open, as hard fists smashed into His face and strong hands plucked out His beard, as a cruel mock crown of thorns was thrust down upon His head, as sharp stones cut into His knees when He stumbled beneath the weight of the cross He was forced to bear, as spikes were driven into His hands and feet, and as a Roman spear was thrust into His side! Oh, so much of His precious blood flowed forth at Calvary. But even as it spilled onto the ground at the foot of that cruel instrument of death, it formed a cleansing fountain of love and forgiveness. And it is in that fount of grace that we helpless sinners can find freedom from the penalty of sin! There we find release from the shame and guilt of our wretched estate. Precious rugged cross! Indelibly inscribed in the stars! To continue in the correct order of the ancient star chart, please select Lupus next. Or click on The Big Picture menu selection to the left for more information about the Gospel in the stars.